Turing Pharmaceuticals CEO Martin Shkreli, the man behind a 5,000 percent overnight price hike on Daraprim, spoke at the Forbes Healthcare Summit on Thursday afternoon and proved that no matter how bad your publicity is, it can always get a little worse. 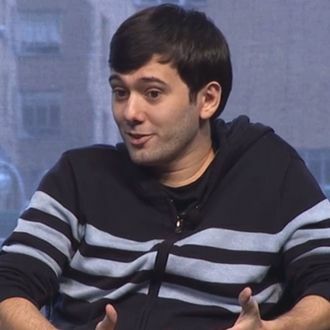 In an interview of his company with Forbes reporter Matthew Herper, Shkreli did not seem the least bit conciliatory as he explained his decision to jack up the price of a drug primarily used by cancer and AIDS patients with severely weakened immune systems. In fact, he said that his only mistake was not charging more. Throughout the 30-minute interview Shkreli returned to his “duty” to shareholders first, likely at the expense any goodwill he may have gotten for almost lowering the price of the drug in late November. He explained that he backtracked on the decision because companies were still “begging” for his business. Shortly after the one-on-one with Shkreli, a panel of executives from the big pharma companies spent most of their time trying to salvage the reputation of the entire sector. “He is not us,” said Merck CEO Kenneth Frazier of Shkreli. Andrew Witty, of GlaxoSmithKline also described Turing’s move as “disturbing,” saying that the decision to raise prices to that degree wastes resources industry-wide.